Here we are again, ready to set some sewing goals for the next quarter of the year and link them up with Adrienne at On the Windy Side. Before I set my goals for this quarter, I would just like to point out that my Craft It Forward gifts are not on the list this time around!! They're finally all finished, though one is still en route to its recipient, so I haven't shared that one yet. 1. The wedding quilt. I've started quilting it, so it's well underway. 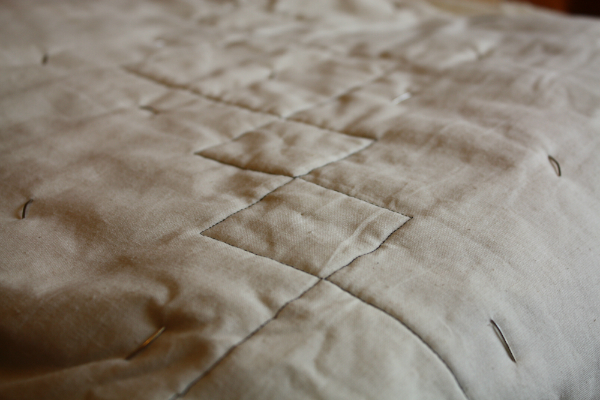 The straight line quilting will soon be finished and then I can move onto the fun free motion stuff. I can't wait! 2. I made this little skinny mini quilt top out of some test blocks for a baby quilt I'm planning. I have some backing fabric ordered, so I want to finish this one up once that arrives. 3. A baby quilt for friends who are expecting their first baby in September. The fabrics are ordered and the test blocks are made (see above), so I can't wait to get started! I'm planning to write up the pattern for this one, so if you're interested in testing it for me, just let me know in the comments. There will be no paper piecing or applique in the pattern, just plain machine piecing, and the test blocks in the skinny mini quilt are the only blocks. I also plan to have a couple of different size options in the pattern. Your test block looks great. Teal is a great colour. I wouldn't mind testing the pattern for you. I am so excited to see the quilting on the wedding quilt, and I am thankful you are feeling better and making quilting progress on it. :) It would be so wonderful if you met all your goals and had a lot of fun outdoor adventures this summer, too. That doesn't look too daunting a list Leanne, I am sure you will rattle through it this quarter :) Would be happy to pattern test for you too.